This is a great time for getting wet in the cause of art – taking your sketchbook and a watersoluble graphite pencil into the shallow surf on a safe beach and getting really close to those waves. You can create some lovely effects with a watersoluble pencil, and either brush over the sketch with a plastic aquash or water brush, or simply dip your finger in the sea and use that! The latter method, of course gives little scope for intricate detail, but that can be an advantage in stopping you fiddling. This A5 sketch of boisterous surf on Marloes beach only took a few minutes and it shows the subtle tonal effects you can achieve with a watersoluble pencil. I worked round the small blobs of white foam, and I was especially keen to capture the interaction of hard and soft edges, many of which kept changing with the movement of the water. Even if you don’t do a full painting from it, the sketch will teach you a lot about rendering wave action. One of the main advantages such a sketch has over a photograph is the dynamism and sense of movement you can portray with rapid and energetic hand movements. So don’t forget to take your sketchbook with you when you visit the seaside. There will always be something to catch your eye. 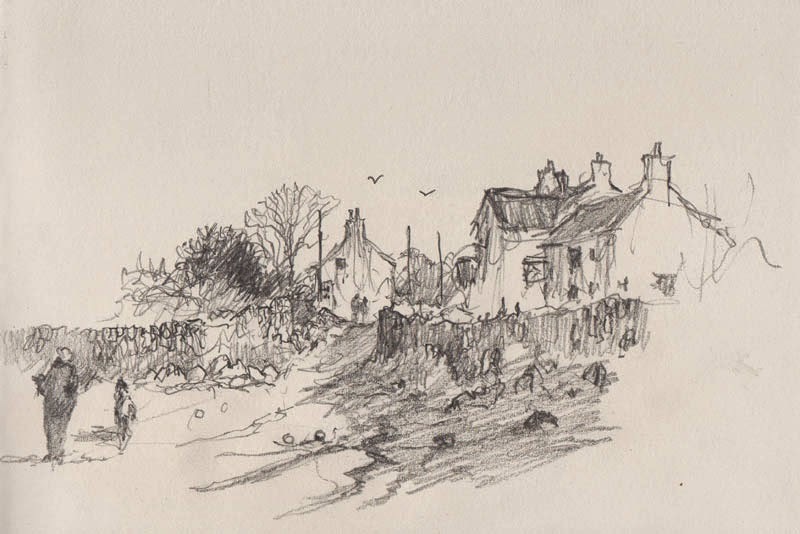 I did quite a number of sketches that glorious June day at Marloes beach, some of which only took 3 or 4 minutes. I have to confess that I’ve neglected this blog lately as I’ve been away enjoying the highlands of Scotland in one of the most beautiful periods of sunshine. 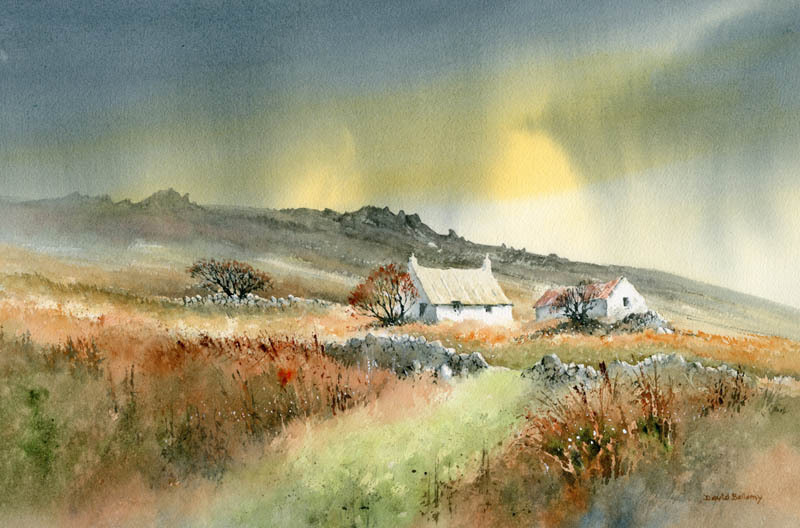 As well as climbing some of the peaks I also found myself drawn towards the stunning coastline, and with a combination of light mist and strong sunshine, day after day brought heavenly opportunities for the landscape artist. 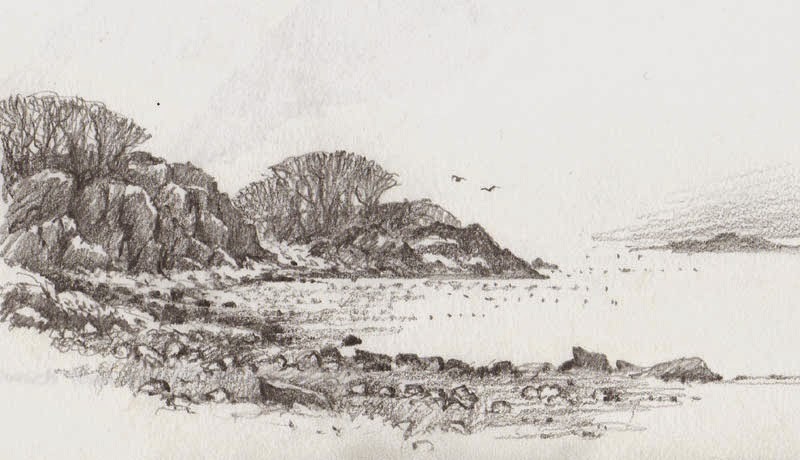 One of the sketches I did was of the rugged west coast as shown on the right. Here I used a 5B pencil on a cartridge pad. Most of the horizon was lost in mist, so I only hinted at it on the right. With the sun providing such strong backlighting the rocks stood out dark, with their tops catching the light, as were the areas of beach. For the sparkling water I have simply dotted the area in question, and this can be moved to suit my needs when I carry out the final painting. A scene like this can look a little desolate without some form of life, so I would introduce bird life or maybe a small boat into a painting. A cormorant stood on a rocky promontory well to the right, and in a nearby beach a number of waders were at work on the wet sand so it would be easy enough to introduce any of these to this scene, perhaps with a strip of sand in the case of the waders. The sand would also break up the monotony of wall-to-wall stones and pebbles in the foreground. I enjoyed every moment I lingered in this delightful spot. Nature washes away all the stresses of life, and for me always injects a tremendous energy into my work. If you go out into the landscape it will always have a lesson for you, without fail. As someone with a deep love for the natural environment I have always treasured my visits to the Highlands, but for how much longer I don’t know. With the encroach of massed wind turbines across some of Scotland’s most iconic landscapes they will before long be submerged in a ghastly industrial mess. Even if the turbines were effective and didn’t involve highly toxic manufacture, didn’t decimate the bat and raptor population, didn’t pose a considerable threat to human health, they should still be kept out of these overwhelmingly beautiful landscapes for which Scotland is (at the moment) world-renowned. As they are primarily a means of making vast profits for corporations, political parties and even many so-called ‘green’ organisations, it is little short of criminal what is happening in Scotland and Wales. Please go and see these marvellous landscapes before they are decimated, and see for yourself what is happening to one of the most beautiful countries in the world. 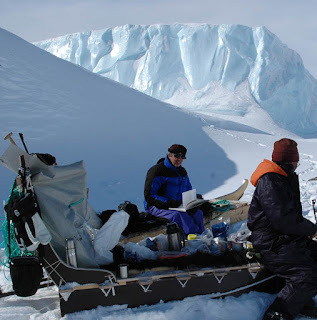 Maintaining morale when out sketching on location is vital, and while some might find a whisky flask useful, I generally rely on tea. Sadly last week in Pembrokeshire the cottage where I stayed lacked that vital ingredient, the teapot. Naturally, this was pretty disastrous, so when out and about I made the most of any such facilities. In the sketch below the right-hand building is a superb tea-shop selling the most delicious cakes, and this is why you might detect a certain hastiness in the rendering of the pencil-work. However hasty we may be in sketching, it pays to consider the composition carefully when creating a painting from the sketch or photograph. Unless the subject is quite a simple affair I normally carry out an intermediate studio sketch to work out where I wish to place the important elements and the main emphasis, together with the sort of atmosphere I wish to convey. In this instance I would move the composition to the right a little so that the left-hand house did not appear in the centre of the composition, as this would be my centre of interest. I would need more detail to be included above the left-hand wall and figures (detail missed because of the urgency of the tea situation), so I would have to resort to memory, a photograph, or the good old imagination. The main figures would be placed further to the right, a little closer to the centre of interest, and I would make full use of the dark runnels of water descending from the centre right – I have already bent them slightly to come towards the viewer as a lead-in. These are the kind of thought processes that go through my mind before I begin the painting. Don’t underestimate the value of tea for the artist. I’ve even used it on a painting outdoors on occasion. Last autumn while I was running a landscape painting course a lovely German lady was painting a cottage, which filled her paper. When I asked her what was her focal point she replied, “The tea-pot.” Sure enough, there was a teapot in the window. Such observations may not only bring a smile to your viewers, but might also result in a sale.